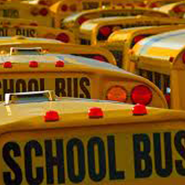 Drivers should be registered for class by a representative of the school corporation. To register your driver(s), click the registration link to the far right of the class information and you will be routed to the class enrollment form. Please enter the school contact name as the Purchaser and enter the driver information as the attendees. The school contact email must be used in the initial information section, but you may add the driver’s email address to their information. The system will email confirmation and informational messages to each email address used. As many classes fill early, it is important to cancel a driver if they are not going to attend so another driver may take their place. If you need to cancel one more drivers for a class, please contact Mike LaRocco at (317) 232-0891‬ or by email at mlarocco@doe.in.gov as soon as possible. If you are exchanging one driver attendee for another, please let Mike know, as the class sign in sheets will be pre-populated with the registered driver’s name and information. A confirmation letter will be emailed for each driver registered in the class. The letter will have important information and links to class materials that should be printed out and brought to the class. Please forward the letter and class materials to each attending driver. If you wish to begin training prior to the selected class, you can request a Certificate of Enrollment (blue card) at any time. Otherwise, the card will be processed at the time of the class. The request must be made by email and include the trainee’s name as it is to appear on the certificate and the last four (4) digits of their social security number. Please email your request to Mike LaRocco at mlarocco@doe.in.gov. Classes will be closed once the class has filled to capacity or three business days prior to the first day of class. If you have any questions concerning the Preservice Classes or registration, please contact Mike LaRocco at (317) 232-0891‬ or via email at mlarocco@doe.in.gov.